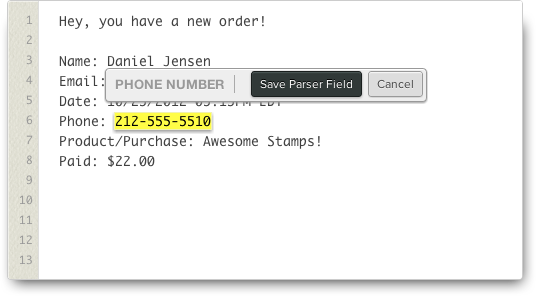 After your parser is set up and you’re ready to add actions, click on the Add/Edit Actions button for your parser. Next, you’ll click on the Create a New Action button at the top of your Actions page. Finally, select Highrise Contact from the list of actions. With Dispatch’s simple-to-use email and webhook parsing interface, it’s easy to set up your parser fields to pull out the appropriate data from your emails/webhooks to pass on to Highrise. After setting up all your parser fields to extract data from your email/webhook, click the Configure Action button. Here, you’ll setup the action to output to Highrise. 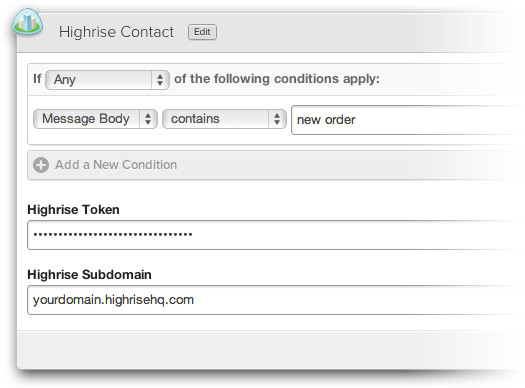 Enter your Highrise subdomain URL and your API Token. Your API Token can be found in your Highrise account under Account & Settings > My Info > API Token. Any parser fields you set up in Step 2 will automatically be sent to Highrise. Additionally, you can add conditional arguments ("Conditions") to tell Dispatch only to fire your Highrise Action when certain conditions are met. And that’s it! You’re all set! Highrise is a small business CRM by 37signals. When you integrate Highrise with Dispatch, you can automatically create new contacts with data extracted from your email and webhooks.